When first encountering this book, I was intrigued by the idea of A’s life, jumping from body to body regardless of gender, race, culture, etc., and it was this original and creative idea that led me to actually buy the book. I am so glad that I did, because I was not disappointed. Every entry/chapter records a day in A’s life, and so as A experiences life from so many different perspectives, so do we. 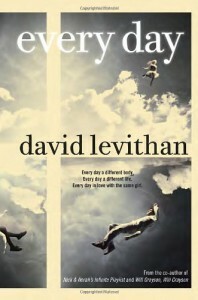 To me, Levithan handled this brilliantly, and this book is definitely an amazing read.